My developer committed a huge mistake and we cannot find our mongo database anyone in the server. Rescue please!!! And then he run ./mongod_back.sh, then there were lots of permission denied, then he did Ctrl+C. Then the server shut down automatically. He then contacted AliCloud, the engineer connected the disk to another working server, so that he could check the disk. Then, he realized that some folders have gone, including /data/ where the mongodb is!!! 2) And of course, is it possible to get the /data/ back? In bash and sh comments are written as # comment, not // comment. Assign someValue to variable someVariable, but only for that one line. After that line the variable will go back to its old value, which is null in this case. Execute the "command" // not a comment, that is the program // with the parameters not, a, and comment. Since // is just a directory (the same as /) this will cause an error message and nothing more. Right now this behavior might seem strange, but you may have already used it in well known idioms like IFS= read -r line or LC_ALL=C sort. I'm sorry to bring this to you, but you basically executed rm -rf /* since $OUT_DIR expanded to the empty string. This will delete the three files/directories some, //, and thing. As already pointed out // is the same directory as /. 2) And of cause, is it possible to get the /data/ back? This is off-topic for StackOverflow. However, you can find many answers to this question on other stackexchange sites. There are recovery tools you can try, but there is no guarantee that you can restore your data if you don't have a backup. Use your backups to restore the database. 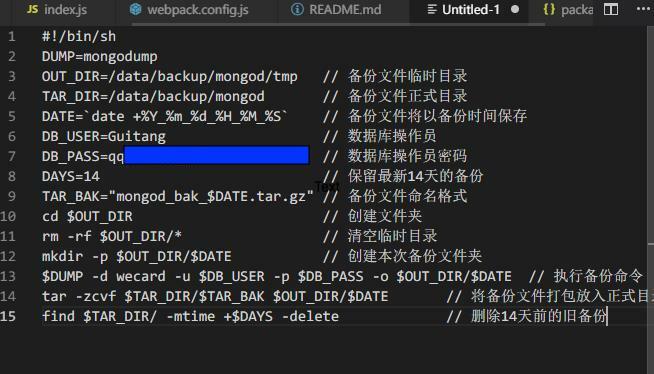 I can read the chinese wordings in comment field, from line 10, the user wants to create a temp folder but used "cd", so if "/data/backup/mongodb/tmp" does not exists in the first place, then $OUT_DIR is empty or null, after that line 11 became "rm -rf /*"
Not the answer you're looking for? Browse other questions tagged bash filesystems ubuntu-14.04 data-recovery disaster-recovery or ask your own question. How to check if a variable is set in Bash?